This vegetable side isn't the same old mayonnaise-covered potato salad. 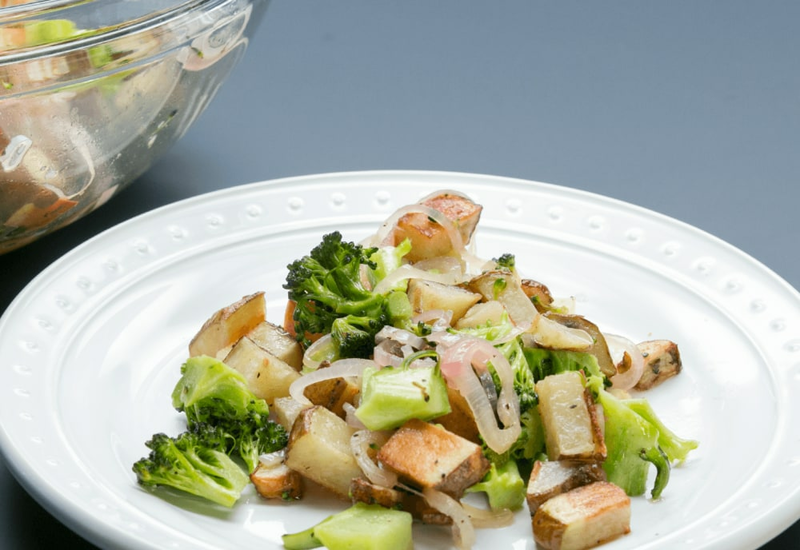 Roasting russet potatoes in their skins gives them a caramelized flavor and delicious crunch, and the starchy potatoes are contrasted with quickly sautéed broccoli and crisp shallots. The vegetables are dressed in a tangy, addictive apple cider and mustard seed dressing. Best of all, the salad gets better as it sits, allowing the dressing to infuse the potatoes and broccoli with flavor. Bring it to the next potluck dinner or serve it as the grown-up version of the classic baked potato for dinner! Divide into servings as a side dish or serve in a bowl to share during a family meal or buffet. Don't stop with broccoli—you can swap the florets with your favorite cruciferous vegetables like shredded kale, chopped collard greens, cauliflower, or Brussels sprouts! To make the salad without refined sugar, try replacing the white sugar with honey or agave nectar. Per Serving: 106 calories; 5g fat; 13.3g carbohydrates; 2g protein; 0mg cholesterol; 149mg sodium. I brought this to a bbq potluck and people loved it! It's a really good twist on classic potato salad, but so much healthier without all the mayo. Super quick. Super easy. Makes a good salad. I added sauteed spinach and some green beans to make it more of a hash, but the flavor is solid. Quick and easy to make, and the one of the few ways I can get my son to eat vegetables.... Which means I'll be making this regularly! Very good dish! I love broccoli, so I am partly biased, but the vinegar and mustard liquid poured over the broccoli gave it amazing flavor. The potatoes were also really good, and went well together. I used red skin potatoes (my fave) and thought turned out really good. It was perfect as a side!